"Fire in the hole!" production assistants yell as three black SUVs come charging down a Stevenson Ranch, California, canyon. Suddenly, a half-dozen explosive charges ignite around the cars, sending them skidding up to a safe house, where a gun battle between FBI agents and vigilantes ensues. A hooded man sprints out of the shack to free two FBI captives from one of the vehicles and rushes them to an awaiting helicopter. 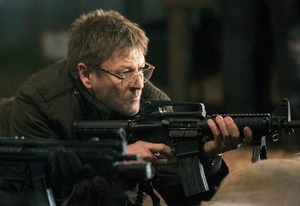 "So far, there's been a great deal of action," says Sean Bean, the smiling star of the new thriller Legends, as he removes his black hood after coming down from the helicopter. "In terms of having fun and doing unusual things on a Monday morning, it's good!" Grand action sequences are an integral element of the series, which delves into the life of deep-cover FBI operative Martin Odum (Bean), who assumes various identities (known as "legends") to infiltrate criminal organizations. But after a mysterious encounter with a stranger, Martin starts questioning whether his real life is just one of his legends. "The show is about the unsung heroes who pay this very steep psychological price for their dedication," says showrunner David Wilcox. "The question that is planted in his mind sends Martin off on a journey that peels back layers of a very deep conspiracy." Today, Bean is taking on the persona of smooth-talking arms dealer Dante Auerbach. Tomorrow, he'll be Len Barlow, a larger-than-life Texan. "For an actor, it's a dream part because you're constantly re-creating yourself in the same show," he says. "It's quite demanding in terms of accents and mannerisms." Martin will also find himself at odds with his FBI team, headed by Crystal McGuire (Heroes' Ali Larter), who runs point on all field operatives. "It's oftentimes a contentious relationship because Martin is such a lone wolf by virtue of his job," Wilcox says. "He doesn't play well with others." Bean's character may be facing an identity crisis, but the Game of Thrones alum (infamously executed in Season 1) insists that, despite his long history of perishing on screen, he won't be losing his Legends status any time soon: "The producers promised me that wouldn't happen!"